Saudi low-cost carrier FlyNas formally known as Nas air will start flights to Europe and Asia early next year, its holding company’s chief told Al Arabiya News on the sidelines of the Dubai Airshow on Monday. While the carrier currently flies to 23 destinations across the Middle East, it will start flying to India, Pakistan and Iran and Europe in March or April 2014, according to Sulaiman bin Abdullah al-Hamdan, The group CEO of Nas holding. At the airshow, al-Hamdan greeted Saudi Prince Fahad Bin Abdullah, head of the country’s general authority for civil aviation. Prince Fahad Bin Abdullah attended the show to inaugurate the new Airbus A320 plane, which will be part of FlyNas's new fleet. 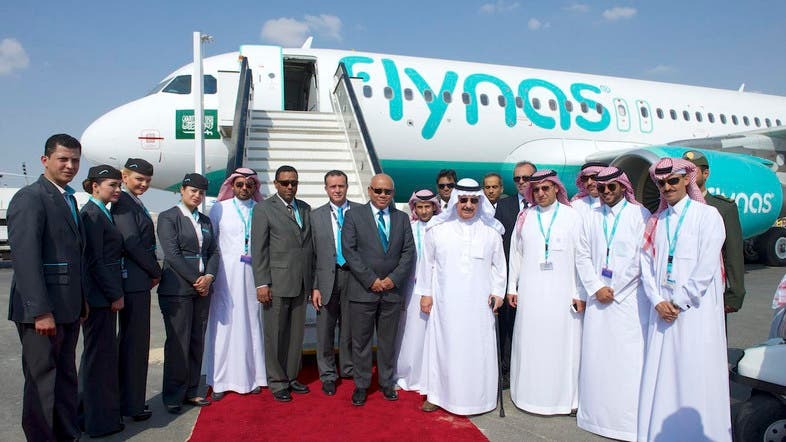 The aviation head praised FlyNas's role in the airline industry as a Saudi national carrier and considered it as one the Saudi aviation sector’s main pillars. FlyNas, along with many others, has suffered as a result of lower passenger numbers resulting from the Arab Spring. “We have lost big markets such as Syria, Tunisia, Egypt and Yemen,” he said. According to al-Hamdan, as well as having the largest fleet of any Saudi carrier, the company has carried over 12 million passengers since its inception. He also added that they are looking to carry 20 million passengers by 2020. Despite the global airline industry’s high level of competition, al-Hamdan stated the sector’s competitiveness helps boost the drive of the company and its employees to succeed. “Any market without competition is not worth working in,” said al-Hamdan.